See our all-volunteer projects on Facebook. Rebuilding Together is the nation's leading nonprofit organization working to preserve affordable homeownership and revitalize neighborhoods by providing home repair and renovation services free of charge to those in need. We strive to ensure low income homeowners are safe, warm, and dry. 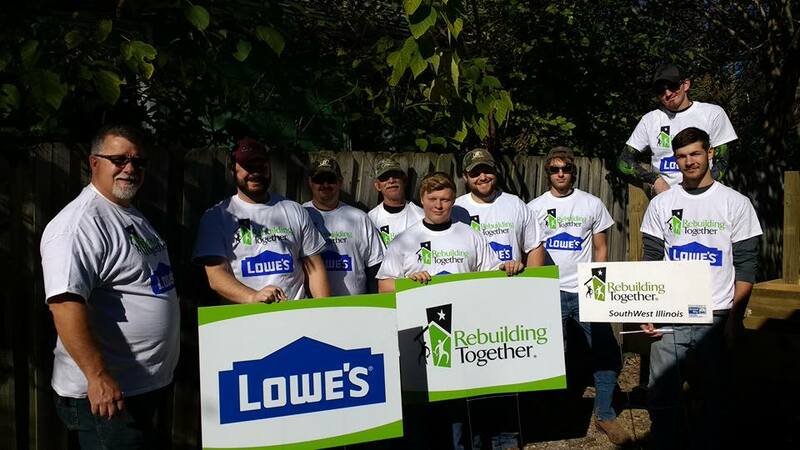 Rebuilding Together SouthWest Illinois is an organization where hundreds of volunteers and donors each year can feel the impact of helping their community. Volunteers leave the project homes exhausted, but with a wonderful sense of joy and accomplishment at how we have improved the quality of life for these homeowners. The appreciation expressed by the homeowners makes all our efforts worthwhile. Every dollar donated to Rebuilding Together is turned into four dollars of home repairs and modifications. We are a proud member agency of the United Way of Greater St Louis. We focus on seniors, persons with disabilities, veterans, and families. Rebuilding Together SouthWest Illinois is focused on ensuring low income home-owners are safe, warm, and dry. As economic situations continue to worsen, along with rapidly increasing costs of homeownership and healthcare, many low-income, disabled and elderly families are forced to choose between daily necessities and much needed home modifications or repairs. 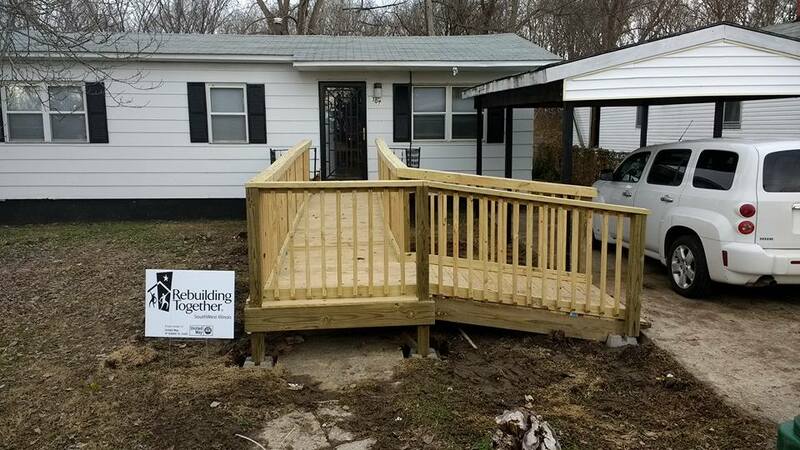 Rebuilding Together SouthWest Illinois is committed to rehabilitating the houses of low-income, elderly, and handicapped homeowners, so they can live independently in warmth and safety. Volunteers come from all walks of life to give one day of work to help their neighbors. Are you a weekend warrior with an interest in home modifications? Or maybe this is your first project in home repair. Regardless of your talents, we’ve got a project tailored for you. Projects include painting, ramp building, safety modifications like grab bars, and so much more. Or maybe you’re more interested in program coordinating. Are you a web designer or a gifted fundraiser? Do you want to lend your voice to promote Rebuilding Together SouthWest Illinois? We need you! Come in and meet with our volunteer coordinator and we’ll match you with a great project that can boost your resume, brighten your day, and give you memories for a lifetime. Teams of generous individuals get together to help deserving homeowners. We need your help! Does your civic organization or your business want to get involved? Contact our office to find out how you can sponsor our events, projects, and operations. We are a small grassroots nonprofit and independent 501c3 operating in Madison and St Clair counties in Illinois. You can be assured that your dollars stay in this community and help this community. For a staff and board of directors listing, click here.